Historical research into the colonial era of Spanish Florida requires familiarity not just with the Spanish language and archival organization of the 16th-18th centuries, but also with archaic handwriting styles used by colonial notaries. The study of such handwriting, called paleography, is sometimes very difficult and often tedious and frustrating, but permits the researcher to gain access to a wealth of historical texts and data that have rarely, if ever, been examined in detail by modern scholars. In contrast to English, the Spanish language has changed relatively little since the colonial era, and anyone who reads and understands modern Spanish can probably navigate through Spanish texts dating to the 16th, 17th, and 18th centuries, bearing in mind that spelling and abbreviations have changed somewhat, and that some vocabulary common in that era is no longer in use. Nevertheless, handwriting styles of the colonial era were strikingly different from modern script, and it is in this area that considerable skills must be acquired and refined over the course of time. Since Spanish notaries were commonly paid by the line, their lines of notarial script tended to be short, and the letters and words long and extended. Capitalization was used only irregularly and without any rhyme or reason, and punctuation was never used. The pen was only rarely lifted between individual words, and words were cut-off at the end of lines without dashes to indicate truncation. This style of writing, sometimes referred to as “chain writing,” is probably the most difficult to master for the novice. Other difficulties exist, of course, including ink bleed-through from opposite sides of each page, and occasional deterioration of original documents from old age, bookworms, and even exterior charring resulting from a fire in the AGI during the first part of this century. The best (and virtually the only) way to learn colonial Spanish paleography is by trying and practicing. The document reproduced on the right is a scanned and recolored photocopy of a microfilm of the original charred page located in the Archive of the Indies in Seville (click on the image to see the full-size document). This page was one of hundreds of pages of testimony that was recorded by notary Francisco de Rueda in the spring of 1660 in St. Augustine, Florida, and recounts the testimony of Adjutant Pedro de la Puerta regarding the initial events of the Timucuan rebellion of 1656. The testimony picks up in the middle of a description of Florida Governor Don Diego de Rebolledo examining a stack of wooden beams for the fort, and recounts the arrival of Sergeant Major Don Juan Menéndez Márquez in St. Augustine after having witnessed several brutal murders in his cattle ranch called La Chua, located just south of present-day Gainesville, Florida on the margin of Payne’s Prairie. 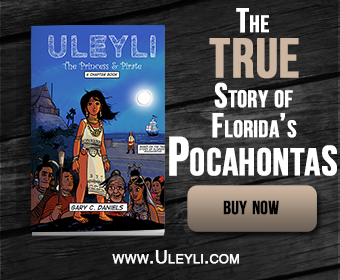 If the testimony intrigues you, you can learn much more about the Timucuan rebellion in my most recent book The Timucuan Chiefdoms of Spanish Florida, which you can order through the link on my Bio page. In order to provide visitors with an opportunity to test their skills, below I have provided transcriptions and translations of the document above. 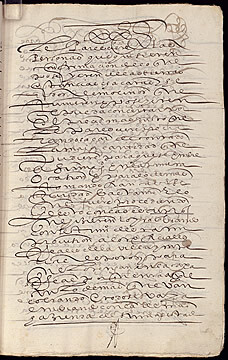 In the column on the left is a direct transcription of the original Spanish script, separated by the original lines used by the notary for purposes of comparison with the image above. On the right is my literal translation in English of this same Spanish text. I encourage visitors to make a transcription from full-size image (click on the smaller version above), and then compare it with mine (which I made while holding the original, which is of course much easier to read). No cheating, and good luck!